In low tunnels plastic covers (1.0 to 1.5 mil thick) are supported above the crop by wire hoops made of No. 9 wire cut to lengths of 65 to 72 inches. A simple way to make hoops already in a hoop confirmation is to buy a coil of wire and use bolt cutters to snip the hoops at the desired length. The ends of the hoops are inserted 6 to 8 inches into the soil on each side of the row so that the width of the hoop at the base is 24 to 36 inches and the height at the apex of the hoop is 14 to 18 inches. The hoops are spaced about 4 feet apart in the row. There are many variations of these dimensions, depending on crop size. Hoops made from a coil of wire are installed by hand; but for machine-installed hoops, the wire has to be straight to properly feed into the machine. For most crops grown with hoop-supported covers, black plastic mulch is used for weed control as well as for improved crop growth. After the hoops are set, the plastic cover is applied and secured by burying the edges with soil. The cover should be taught to prevent flapping in the wind. An alternative way of securing the cover is to insert an outer wire hoop over the inner hoop with a solid (non-perforated) plastic cover wedged between the two hoops. With the double hoop technique, the edges of the plastic are not buried, so that the cover can be raised and lowered for ventilation. Another method of covering is to use plastic with either slits or perforations (3/8 inch holes). Generally, the daytime opening is not required, although at night there is a greater loss of heat through these openings than through solid plastic. The advantage over solid plastic is minimal, if any, labor for manual ventilation. The daytime opening is necessary for crops such as tomatoes and pepper if the temperature under the cover is expected to exceed 90oF for several hours. Under such conditions, the easiest way to ventilate quickly is to make long slits at the top of the low tunnel; but this should be done in anticipation of the high temperatures, not after the fact. Cucurbits (melons, cucumbers, and squash) are more tolerant of high temperatures. 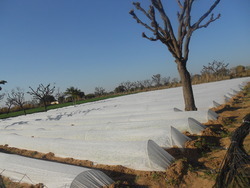 Depending on the crop and the environmental conditions, the covers are left in place for 3 to 4 weeks and then removed. For crops requiring bee pollination, the covers are removed about the time of the appearance of the first female flowers. For wind-pollinated crops (tomato, pepper, eggplant), time of removal is somewhat temperature dependent since temperatures should not exceed 90o F at the late bud to open flower stage for more than a few hours. Research is being conducted at the Center for Plastic culture on the use of various kinds of low tunnels both in the field and in high tunnels.